I remember several years ago in Florida when a fellow minister set up an appointment with me, but I didn’t know what it was about because he wouldn’t tell my secretary. He just said it was critical that he see me. I didn’t want to let him to do it. I said, “No, No, that’s alright. I accept your apology.” He said, “Please.” I felt so ashamed… foolish… and a little odd. But that fellow minister washed my feet right there in my office. To this day, it stands out as one of the highlights of my ministry career, and I’ll never forget that act of love. Maybe today you need to do something radical to show others you love them. Maybe there’s a broken relationship that you need to start mending with a phone call. Maybe you need to show someone you love you appreciate them in a big way. Whomever and whatever it is, let them know today how much you appreciate them! LET GOD’S LOVE SHINE THROUGH YOU TODAY BY SHOWING SOMEONE THAT YOU CARE FOR THEM IN A BIG WAY. One thing that’s certain is that one day, every one of us will die. While this isn’t something we tend to dwell on, it is a reality. 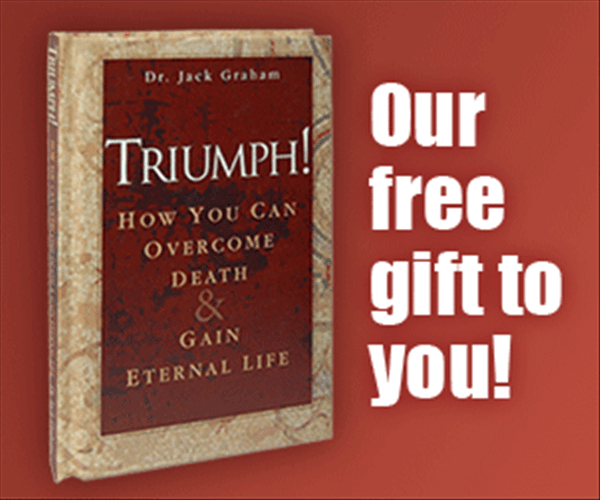 So as my Easter gift to you, I want to send you a free copy of my book, Triumph! How You Can Overcome Death & Gain Eternal Life, to show you how you can have victory over death through Christ’s resurrection power! In this 58-page book, I remind you of what God has done for you because of his love for you. I’m confident Triumph! will help give you the encouragement you need to live victoriously. And, you can use it as a powerful resource to share God’s love with others. So please request your free copy of Triumph! How You Can Overcome Death & Gain Eternal Life today and find out how, through Christ, you are more than a conqueror over death! Originally published April 13, 2012.